The Clarion Borough Police Department is committed to protect and serve through fairness, compassion, and excellence while providing police services in accordance with the law and sensitive to the priorities and needs of the community. 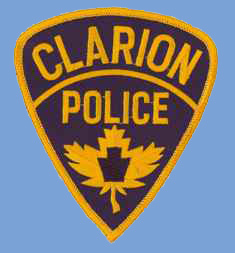 The Clarion Borough Police Department was first established by an Ordinance on May 2, 1944. At that time, one officer was employed as Chief of Police. During the next fifty years, the Department grew with the community. Today, the Police Department is staffed by (21) twenty-one well-trained, professional officers. Every officer employed has completed a certified Municipal Officer’s Training Academy, and every officer is certified on an annual basis. The Police Department employs a detective, two D.A.R.E. officers and all officers are trained for bicycle patrol. The Department uses four police vehicles and has a computerized reporting process. Approximately 12,000 calls for service or criminal incidents are answered each year. In addition to the uniformed officers, four other employees are employed for support and meter enforcement officers. Copyright © 2019 Clarion Borough. All Rights Reserved.